In honor of Bastille Day, here is a fascinating French cookbook to explore, “The Art of Cuisine” by Henri Toulouse-Lautrec (yes, the artist)! This is in fact a compendium of his recipes, published after his death, along with sketches and other notes. An avowed denizen of Parisian nightlife, Toulouse-Lautrec was also something of a gourmand. In his cookbook you will find recipes for such exotic fare as “baked kangaroo” (containing no kangaroo) and more simple recipes typical of his native Southern France. Today is Bastille Day, so it seems only appropriate that we cover our favorite French food group: Desserts. 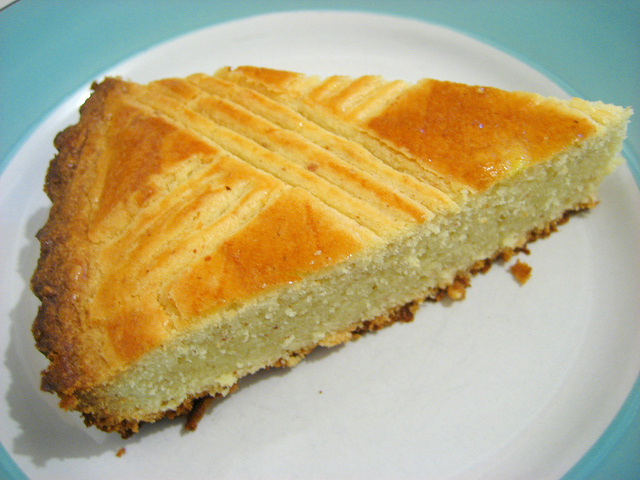 The dessert at hand today is the Breton Butter cake aka Gâteau Breton, a shortbread-like cake with a signature crosshatch design. This is a simple cake from the Northwest of France (where it gets its name from the region of Bretagne/Brittany), an area with a distinct food culture and language. The cake itself really is nothing more than eggs, sugar, flour and (lots of) butter – but sometimes simple things are the best! Check out recipes from Gâteau Breton from Lottie and Doof, Not Quite Nigella and Serious Eats.